Is BCM Scam? Read in our honest binary options broker BCM review! The lack of experience can be a significant drawback when it comes to working in the financial sector, and any company that does not have a long-lasting history in the business can be a dangerous and unpredictable partner. Since safety and security are of the utmost importance in the world of binary options as well, broker houses such as BCM binary broker are not the type of enterprise that we would recommend to our readers. If you continue reading our BCM review, you will learn more about this trading company, and you will be able to make an informed decision about investing your money in this broker house. Binary Capital Markets, or BCM, is a provider of binary trading services, and this company is under the ownership of G.S.E. Golden Sky Europe Limited. The headquarters of the corporation are located in Limassol, Cyprus, and the vast majority of binary broker houses are coming from this country. Furthermore, BCM is licensed and regulated by the Cyprus Securities and Exchange Commission (CySEC), and this is a crucial matter in the binary trading sector. Being governed by such a reputable agency means that the chances of BCM scam are pretty small, but clients should still be on the lookout and keep their eyes open for any suspicious activity. The fact that BCM had its “grand opening” just a few months ago, on October 16th, is something you should have in mind, and this lack of experience may prove to be an issue in the long run. When it comes to the trading accounts that are offered by this broker house, Binary Capital Markets is no different than the majority of other brokers on the global binary sky. 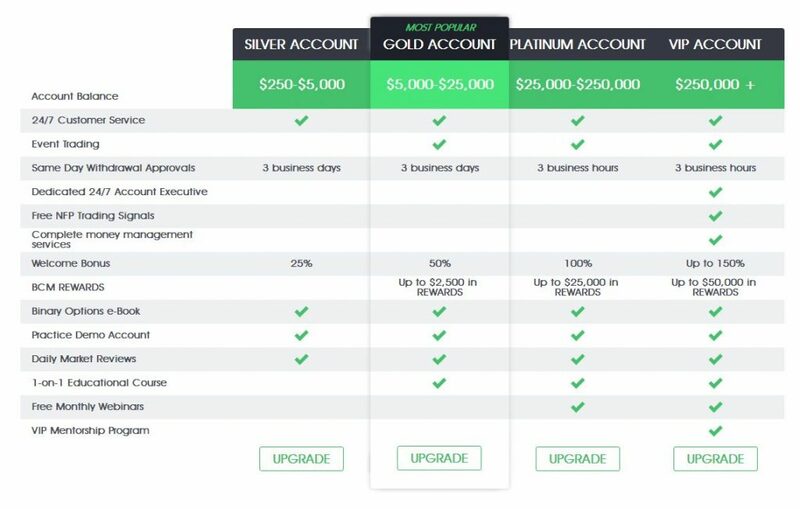 In other words, the lack of originality from such a young company is somewhat surprising, and clients can choose between the standard set of accounts – Silver, Gold, Platinum, and VIP. Luckily, a demo account is available, and this option is usually very useful for inexperienced traders and people who are new to the binary trading. The minimum amount that you need to deposit to start an account is $250, which is also similar to all other brokers out there. In order to make a trade, you will need to invest at least $10, and this amount allows beginners to make more investments and hopefully make some profits. However, clients should be careful when it comes to tempting bonuses that are offered by BCM, and it is well-known that these “generous gifts” often come with demanding terms and conditions. Since BCM is a new company, many people are not familiar with the characteristics and features of its software platform. But, the trading terminal with this broker is similar to all other brokers, and BCM is using popular SpotOption software solution. This platform offers around 70 assets, divided into four different categories, and traders can choose between One Touch options, ladder options, High/Low trading, and so on. However, the payouts of around 90% are slightly unrealistic, and this can be a warning sign for anyone who is planning on investing their funds through this broker house. Most BCM opinions are also pointing out to the fact the test of time is the most significant challenge that this company will have to face, and after a certain period – we will see if it is 100% safe to trade with this binary broker. Safety is the most important when it comes to deposits and withdrawals, and we all want to have our funds and personal information protected as much as possible. 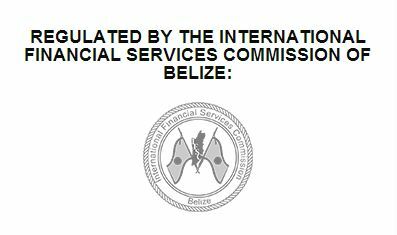 It seems that BCM uses transparent and efficient banking methods, simply because the compliance with CySEC regulations indicates that this is the case. However, the process can take up to 5-7 business days, because an identity check is needed and verification can last a long time. Credit and debit cards, e-wallets, and wire transfer are all available with this broker house, and BCM uses a limit when it comes to the minimum amount that you can withdraw, and this limit is at $100. 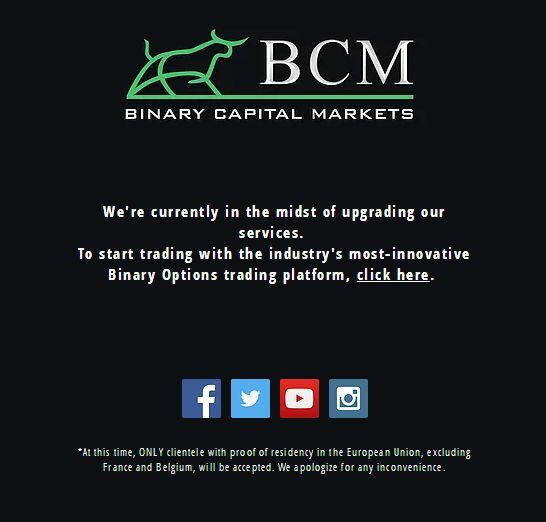 Even though the customer support section at BCM binary options broker contains some educational material and the teams are available 24/7 through phone, email or live chat, it will take some more time to determine if this company is indeed operating in a legitimate and professional way. A couple of months in the business are certainly not enough to establish a credible and reputable name, and the trust of clients can only be built through time and quality service.